There are many names and titles for Jesus the Christ. Each has something unique to inspire in our minds one of the attributes of the Son of the living God. Several of these begin with “I Am” —I Am the Bread of Life, I Am the Light of the World, I Am the Good Shepherd. Each one of these is beautiful and reveals a part of our Savior’s purpose and being. However, it occurred to me that while all of these titles are wonderful, none of them encompass all that Jesus is. For me there is something about “I Am” that says it all. It gives me a concept of who Christ is in the simplest form possible. In my newest painting, I hoped to communicate this idea visually in the immediacy and directness of His gaze with the suggestion of light and creation as a backdrop. 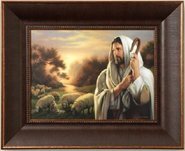 Image Size: 12½" x 12½"
A Giclee on canvas framed in a beautiful 3" dark walnut frame with subtle beading. The Giclee (pronounced zhee-clay) printing process is the best art reproduction method available. It features high quality inks, better resolution, increased detail, and longer life than traditional lithograph prints. As a result they are much closer in color and detail to the original and create more impact than lithograph prints. 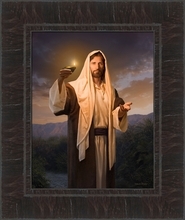 I saw this painting in Deseret Bookstore month after month as we went up to attend the Temple. Each time I would take my husband by the hand tell him to come with me and I would show him what I want. Then, I would lead him the painting, point it out and say,"This is what I want." When it came near Mother's Day I reminded him again. 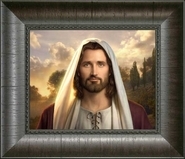 So, finally, we went to the Temple in May; and God Bless him, he bought this glorious picture of our Lord Jesus Christ. Now, it hangs in our living room in a place where I can look at it every day. With the light below shining up on that tender face it is truly a thing of beauty and always reminds me of the atonement and the Sacrament. 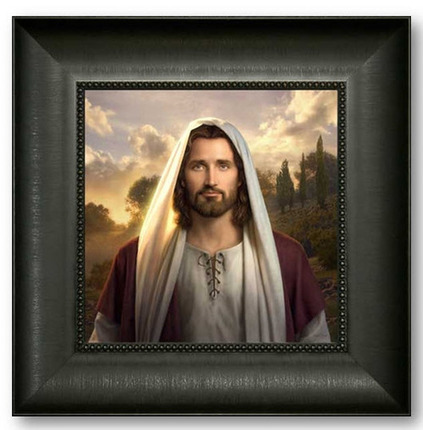 I pray Heavenly Father's blessings on the artist for sharing this vision of our Savior's love.